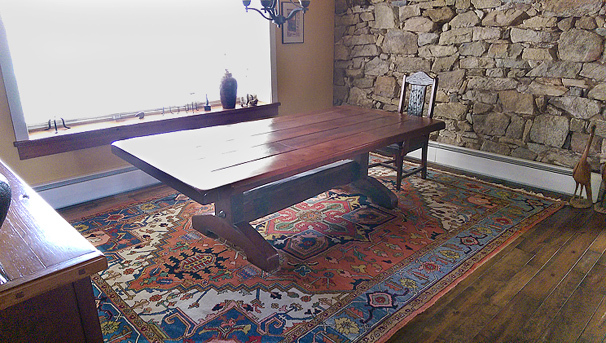 This rustic dining room in Zionsville, Lehigh Valley, PA offer an ideal setting for this genuine hand-woven Persian Heriz Oriental carpet from Nejad Rugs. The interior design elements, such as heavy plank redwood table, stone wall and large oak panel flooring in this modern, rustic dining room in Zionsville, Lehigh Valley, PA offer an ideal setting for this genuine hand-woven Persian Heriz Oriental carpet from Nejad Rugs. Designers, Manufacturers and Importers of Fine Handmade Rugs in Doylestown Bucks County near Philadelphia, Princeton and the Poconos – our showroom, in the center of historic Doylestown Borough at 1 North Main Street, features an amazing selection of quality area rugs at discounted prices with over 30,000 rugs in our inventory. This entry was posted in Designer's notes and tagged a genuine hand-woven Persian Heriz carpet from Nejad Rugs is displayed in a rustic setting, Nejad - Designers Manufacturers and Importers of Fine Handmade Rugs in Doylestown Bucks County, Nejad features an amazing selection of quality area rugs at discounted prices, Nejad Rugs showroom is located in the center of historic Doylestown Borough at 1 North Main Street, Rustic Zionsville Dining Room in Lehigh Valley Features Nejad Heriz Carpet by Theresa Nejad. Bookmark the permalink.